It could have worked out because here drivers are accustomed to bike riders and there is a complete bike infrastructure. But it didn't. Bikes got stolen, demolished or dumped in the canals and it was too expensive to maintain (repairs and new 'old' bikes). That's amazing that Amsterdam did that. 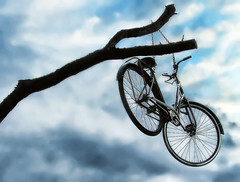 How trusting to leave bikes just hanging around! Toronto's are locked and the hub, where you pick them up, verifies users so in theory they would know who didn't bring them back to a hub (ie: who took it and threw it in a canal if we had them). I mean, I assume that's how it works, since I've never used it. The new idea is to combine the program with a training program for fixing bikes. Great idea, I thought.